I am a Senior Business Technologist and Project Director based in Orlando, Florida. I am a business professional dealing with issues and solutions to problems in the areas of Information Lifecycle Data Management, electronic business transaction flow and business intelligence data storage & retrieval. With a focus on enterprise-wide business analytics he addresses the institutional challenges to reform the business processes across the board. I am a leader in the organizational challenge to move from a siloed approach to more inclusive information management programs that work across the entire company. I specialize in ERP/CRM systems with an emphasis on Order to Cash, Procure to Pay and the deployment of the electronic transaction interface transactions and third party systems interfaces. 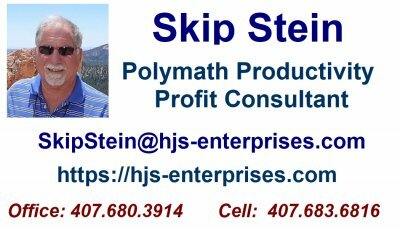 My employment and consulting history includes such businesses as Manufacturing/Distribution, Pharmaceuticals, Oil & Gas, Petrochemical, Telecommunications, Public Accounting, Banking and Finance, Resort and Hotel Management, and Retail Sales and Distribution, and Healthcare. Within these organizations, I have performed in positions as Programmer Analyst, Project Manager, Operations Director, Director of Development and Chief Technology & Information Officer. My skills include the ability to take charge of projects, generate cohesive team participation and complete assignments in a timely manner. I have developed project management and team building skills while utilizing precedence and critical path method management techniques. Most recently, I have worked with Electronic Business Flow Management (EBFM) and Electronic Transaction Flow (ETFM) systems utilizing EDI and Web Commerce tools to implement business-to-business communications solutions in conjunction with International ERP systems deployments. During my career, I have enjoyed an in depth involvement with a varied set of technologies and utilized them to provide productive and cost effective business solutions. As a Project Manager, I have worked around the globe reaching from the Prudhoe Bay Alaska to Hong Kong to Europe and Mexico. Working on massive projects like the Prudhoe Bay Sealift Project in Alaska to major manufacturing/distribution operations involving airfreight operations from Hong Kong to the USA, and warehouse management systems in Europe, I have developed team management and implementation skills enabling these and other projects to be completed on time and within budget. I am well versed in financial systems and operations working several years in commercial banking industry and public accounting. I have implemented Enterprise Resource Planning systems for manufacturing/distribution, electronics and pharmaceutical companies. He has also designed and implemented various manufacturing/distribution/financial EDI transaction systems for major manufacturers in the USA and Europe. Spoken Languages: Fluent: English (USA), Light: Spanish, German & French. EDI Standards: ANSI X.12, EDIFACT, VICS, UCS, ODETTE, TRADACOMS, and HIPAA X12N; AS2 Security including Secure FTP, Trailblazer, IP/NET , Inovis/QRS, Seeburger, MS, Liaison Technologies and others. Implemented and automated the Procure to Pay Purchasing Department EDI integration with key suppliers for a Mid-South Refinery. Designed electronic commerce (EDI) transaction specification, standards and business processing procedures. Worked directly with suppliers to coordinate and test full purchase functionality for blanket ordering, stock and non-stock items controlled by the JD Edwards ERP system. Coordinated the JD Edwards 8.12 integration remediation activities for a Midwest wire rope manufacturing company. Coordinate business process enhancements across all business units. Revise and implement new business practices to deal with newly installed JD Edwards ERP system. Plan integration process and electronic transaction processing for Order to Cash, Procure to Pay and banking/financial integration. Worked with banking relationships and trading partners to implement cash payment and receipt processing using a variety of systems including Lock Box, EDI direct payment/deposit and JD Edwards integration with international banking systems. Also integrated credit reporting systems from JD Edwards to Dun & Bradstreet with emphasis on vendor payment history. Managed the establishment of EDI Services for a West Coast transportation company; establishing EDI operations with both in-house (Boomi) and outsourced transaction management companies. Integrated accounting and transportation systems to third party billing and transportation scheduling companies using PowerTrack, FreightDATA, and other systems. Design and implement inbound electronic transaction three way invoice matching processing for a large distribution company. Worked the procure to pay business cycle and re-engineered procurement and invoice payment processing. Establish electronic payment processing to replace ‘paper checks’ to expedite payment processing. Initiated remittance advice transmission to suppliers for invoice payments. Project Manager and coordinator for major media distribution company’s corporate system integration efforts. Trained project managers on techniques and approaches to organization and functional representation of project efforts. Developed composite project overview and plans for major corporate projects. Coordinated efforts of project managers and teams to achieve project objectives. Coordinate and manage the conversion of EDI resources and Order to Cash processing from a JD Edwards World to Oracle Enterprise One ERP system. Worked with deployment team to configure all E1 options and configurations for manufacturing, distribution and finance. Developed comprehensive data analysis and mapping for all transaction processing. Configured shipping and labeling systems in conjunction with Data Systems International (DSI) programs. cost effective return on investment (ROI), the total picture of how the IT organization contributes to the profitability and cost effective use of business resources. Effectiveness of IT staff and policies and procedures as well as IT Internal Controls and methodologies in use are evaluated. Coordinated EDI and transactional interface in conjunction with an Enterprise One (JD Edwards) upgrade to release level 8.10 for a West Coast importer. Developed table/file extensions for auxiliary file processing to facilitate inbound and outbound transaction processing. Made recommendations for EDI functional capability upgrades. Implemented the Electronic Transaction Flow Management (ETFM) system to identify and address all electronic transaction processing for the company. Developed project plans for the EDI Gentran to webMethods conversion with integration to web services and order processing. Consolidate all financial order-to-cash and order-to-pay transaction activities plan and schedule. Performed analytical reviews and developed functional and technical design specifications to coordinated hospital, clinical, radiology and laboratory systems data flows to enhance a new Deductible Health Maintenance Organization (DHMO) billing processes. Coordinated between each of the subsystem teams to accelerate their data capture and process flows into an enhanced DHMO member billing process. Developed testing criteria and monitored testing and implementation. Worked with accounts receivable and adjudication functional teams to process data in a timely manner in order to produce billable results. Project anticipated return is a $1.4 million revenue increase in first six months. Managed, coordinated and implemented the EDI deployment of an International hard-goods manufacturer in conjunction with a JD Edwards OneWorld-XE implementation. Project efforts included coordination with multiple divisions across the USA, Canada, Mexico, Australia and Europe. Centralization efforts of the EDI processing included a new implementation of Inovis TrustedLink with new deployments of all purchase order, shipping and invoicing related transactions (EDI 850/855/858/860, 856/858/860/861/ 810/820/828). Accounts Payable EDI/EFT (820) transactions were implemented for payment of both vendor accounts as well as internal employee accounts. Trading Partner interfaces for inbound Purchase Order, Point of Sale, and order confirmations were implemented. Outbound Advanced Ship Notices (ASN/856), Invoice (810), Remittance/Payment Advice (820) and other supporting transactions were also deployed. Developed and implemented internal Accounts Receivable processes for an international household appliance manufacturer and distributor encompassing activities currently provided by a third party service. Implemented Harbinger EDI interfaces to JD Edwards A/R for trade customer payments and remittance data; established trade customer lockboxes, built an automated cash application process for JD Edwards A/R, and staffed/trained internal resources for executing the necessary manual A/R cash application activities. Project included banking lock box interfaces be developed with electronic funds transfer processing and automated remittance advice processing utilizing EDI X.12 standard transaction sets with adjustment activity reported on EDI X.12 transactions. Implemented a migration to Oracle based ROSS ERP systems and full implementation of Sterling Gentran NT Server EDI interfaces to national retail chains for processing purchase orders and invoicing. The project required setup and testing with multiple large national retail chain store operations and order entry systems for the manufacturing, shipment and delivery of drug and pharmacological products. Established communication systems and facilities for an international long distance carrier to exchange Billing and Collection as well as Equal Access data with USA based local and regional communications providers. Implemented an EDI system that provided communications linkage to the local exchange companies across the country to transmit billing and collection data. Installed and implemented software and hardware solutions to meet the communications requirements including a combination of leased line and switched network configurations. Implemented and maintained Lawson financial systems, including the General Ledger, Accounts Payable, Point of Sale and Distribution modules. An EDI network was utilized to download daily credit card sales that were consolidated to a central clearing operation improving cash flow. Pricing level detail, daily sales dollars and inventory movements were exchanged with the host system using standard ASCII transmission protocols. Managed the development of a comprehensive revenue and royalty distribution accounting system for a national oil and gas exploration and production company. The system accounted for lease record holdings for all royalty interests. Oil and Gas production values were input and allocated to leasehold interests and royalty computations made with subsequent royalty and revenue amounts distributed. Designed and developed a comprehensive revenue accounting system for an international petrochemical company that interfaced directly with the general accounting systems. The system captured revenue generated from field operations through refinery sales and computed the royalty proceeds to feed the royalty distribution subsystems.